Some people say overalls are for farmers and babies, I say not true! Overalls, if done right can look edgy and completely fashionable. I loved overalls during my pregnancy; they look so cute and more put together than leggings and a t-shirt. It has been eight months since I gave birth! I still have fifteen pounds to go (nothing compared to the 40 I gained!). I am finally able to fit back into some of my pre-pregnancy clothing. Last night I wore my leather overalls. I have always loved overalls because they're fun, playful and so comfortable. 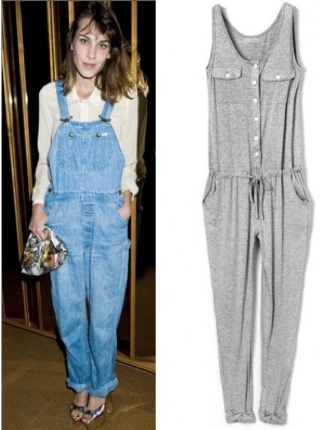 The wonderful thing about overalls is that they are having a fashion moment. Overalls are so perfect and practical for that pregnant bod. With extra space for your growing belly, why not jump on the overall bandwagon? Modern styles are also so much cuter and fresher than the ones I bought in 1999! Today's overall has been updated since the nineties; many jean companies are even making cute distressed stretch denim styles. You can also find great cotton overalls that are just a little more comfortable. The overall is an easy go-to outfit for everyday; the look is relaxed and chic. To avoid looking like you live on a ranch (unless that's the look you're going for), balance them with a feminine top, roll up the cuff and pair them with a mid sized heel. Or, pair your overalls with a cute t-shirt and tennis shoes for a more laid back look. Whatever you do, avoid pairing your overalls with a western shirt and cowboy hat! Sure, wearing overalls while pregnant makes it a little harder to go to the bathroom, but I think the comfort is worth the extra buttons. Whatever you decide, it’s always fun to try new styles when you are pregnant. In my opinion, pregnant women look cute in everything. Although you might not think so, it's a great time to experiment with new styles.